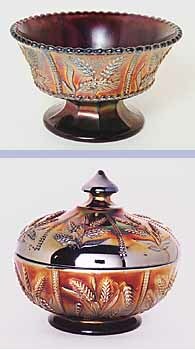 Shown here are three of the four known pieces in this extremely rare pattern. The amethyst sweetmeat on the left is the same size and shape as the Grape and Cable. Formerly in the collection of Floyd and Cecil Whitley, it sold for $8,000 in 1999 and $6,500 in 2006. The sherbert, also in amethyst, is courtesy of Jerry and Carol Curtis. 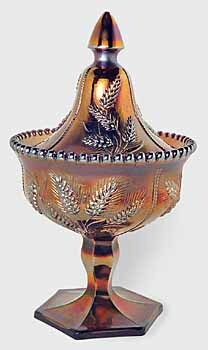 The covered serving piece in amethyst is courtesy of Don and Becky Hamlet. A green sweetmeat is reported by Carl O. Burns. In 2012, a sweetmeat with a purple base and green lid sold for $2,200.